This size desktop speaker isn't for everyone, but for those who can afford to put down for them, they're entirely worth it. The A100's fit nicely in our oversized desk and really improved the audio quality from the shallow, weak sound output by our monitor. 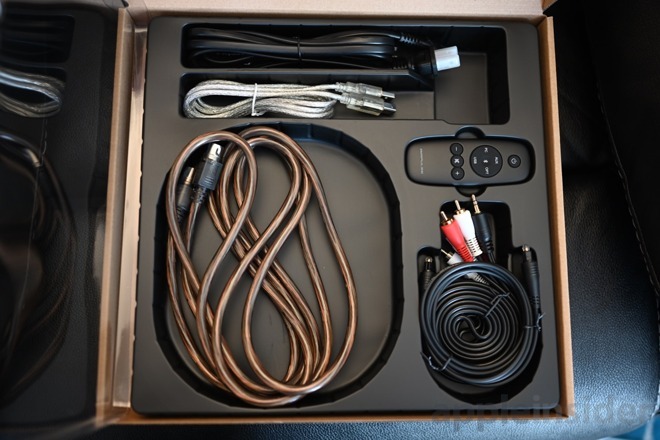 In the box, you receive not only the speakers, but all the cables you could need as well. That includes optical, RCA, and USB for whichever input you prefer to use. We really appreciated not having to supply our own. They have glossy, red or black lacquered cabinets that are surprisingly compact for the sound they are able to produce. The bulk of the time we used these speakers on our desk. The normal direction of the audio would, therefore, be slightly cast down from our ears. Luckily, included the box is a pair of foam blocks that help orientate the speakers upwards slightly, as well as help reduce vibrations as we crank the volume. AirPulse has blessed these speakers with copious options for getting your audio to the speakers, as well as some for getting it out. On the rear of the unit, there is a bevy of ports including dual analog RCA, optical, and USB. An optional RCA output can be used to wire up a separate sub, though when used solo bass was more than sufficient. If an external sub is connected, its volume can be controlled through the master volume knob. A toggle switch on the back of the cabinet is used to power the speaker on/off and sits below a trio of knobs that adjust the volume/input, bass, and treble. The knobs have a pleasant amount of resistance to them that gives you a sense of control over them though the amount of change they inflicted wasn't huge. The idea seems similar to that of the Marshall lineup of speakers that offers the same knobs. They change the output a bit, but not greatly. It is more about tuning to your exact taste than really changing the overall voice of the speaker. There is certainly a difference when adjusting them, but don't expect to hear a wild swing in bass just because you moved the knob to ten. Other than the wired inputs, these speakers also work over Bluetooth which is going to be the best way to get it there from your mobile device. In our setup, we have our Mac wired in, then also play over Bluetooth while at the desk. A similar setup could be done with these sandwiching your television. Bluetooth is fine, and the range was solid for Bluetooth 4.1 with seldom drops in audio as we moved about the room/house. Audio quality over Bluetooth benefits from AptX support, assuming you have a device that supports this. iPhones, for one, don't support this. There is room to grow here though with Bluetooth 5 and AptX HD both available, these would have been improvements. In addition to the controls on the back, a remote is included in the box. 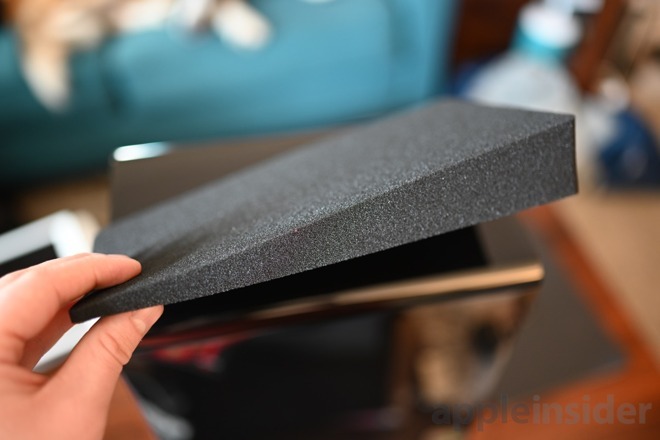 It has a small form factor with a curved underside that feels good in the hand. You have basic controls available such as switching inputs, adjusting the volume, and toggling power. While we appreciate the ease of use a remote brings, it is yet another device to sit on our coffee table. 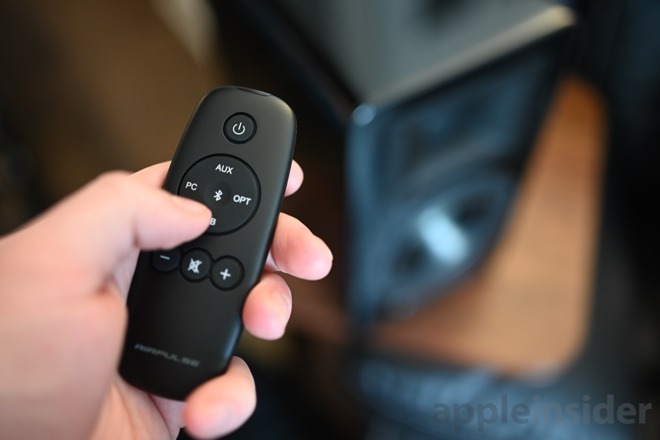 A solution for Apple users would be for AirPlay 2 to be baked in. This Wi-Fi-based protocol allows for multi-room listening and adjusting volume easily through Control Center. Unfortunately, Wi-Fi and AirPlay aren't options here. This is a real disappointment as it offers the best wireless audio on Apple devices. When you shell out this much for a set of speakers, you want to be sure you are getting the highest fidelity possible. As powered speakers, no external amp is going to be required here which helps them occupy even less space than they otherwise would. Within the cabinets, there is a horn-loaded 2.5-inch aluminum ribbon tweeter perched above a custom 5-inch coil bass/midrange driver with an aluminum cone that is suspended in an ultra-rigid cast magnesium alloy frame. All of that is driven by two high-efficiency Class D amps. The top, fragile tweeters are protected by way of a mesh metal grille. 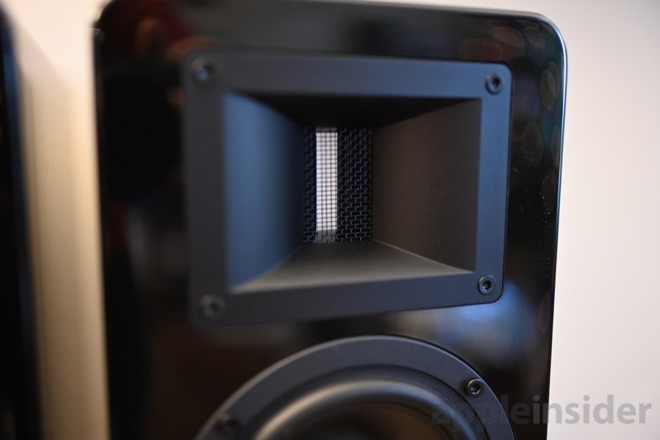 For their size, the weight of these speakers was more than we expected, likely due to these powerful internals. These speakers also use TRANSPARENT audiophile grade speaker cable made which is designed for minimal signal loss. The cabinet is an impressive 18-mm thick which is well-dampened and almost completely removes any resonance or vibration on our (already wobbly) desk. When you surpass the run-of-the-mill $200-$500 speakers, critiquing audio quality gets to be a difficult task. The nuances are all the more subtle and can frequently be a matter of preference. It also depends on the source input you are using. For example, we definitely noticed fuller-sounding audio when we played back our standard testing mix over a DAC aux cable than when over Bluetooth. During our listening tests, a bright point us was the clear, crisp top-end. It always got just to the edge of being too brittle without going over the edge making instrumentation really bright. This was particularly noticeable in Glitter and Gold which really shined. The midrange was well balanced for a full, warm sound that didn't get overburdened by bass. For our taste, the bass was balanced perfectly but those who want the walls to shake always have the option for an additional external sub. As there are two separate speakers, when properly configured the soundstage was expansive and stereo audio performed very well. We felt that there was actually rather large "sweet spot" between the two speakers, giving us some wiggle room in our positioning before it becomes over-balanced to one side. To test this, we love listening to Moving in Stereo which is a great representation of the effect. For a brief period, I also hooked these up via optical to our television to watch a few movies through our Apple TV. It easily outperformed our existing Sonos PlayBar in terms of overall quality, though the vocals do get buried a slightly more when compared to a speaker that was tuned for spoken word in particular. Without a true surround sound system, we'd use the A100's in the living room any day. 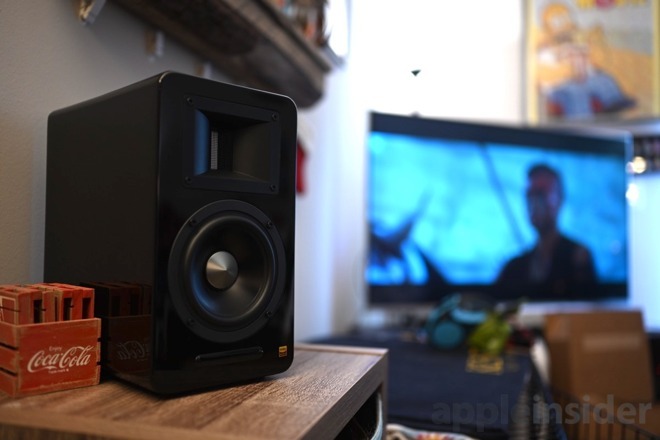 We thoroughly enjoyed our time with the AirPulse A100 wireless speakers. The difference between an $800 set of speakers and a couple-hundred dollar HomePod is night and day. 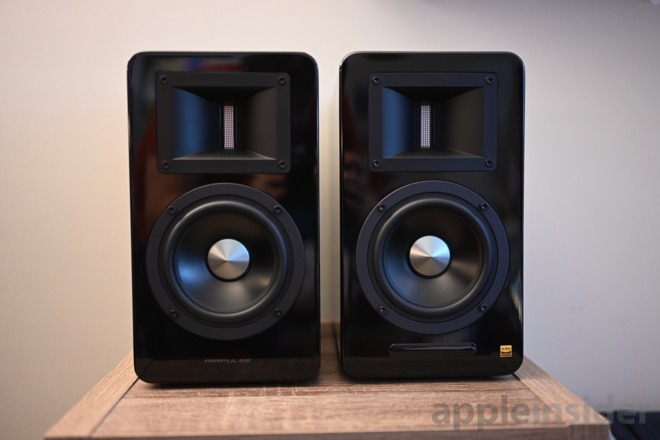 Even using two HomePods doesn't sound as good as the A100s. Some bulk at spending so much on a speaker setup but in a competitive market these still are far from the most high-end. 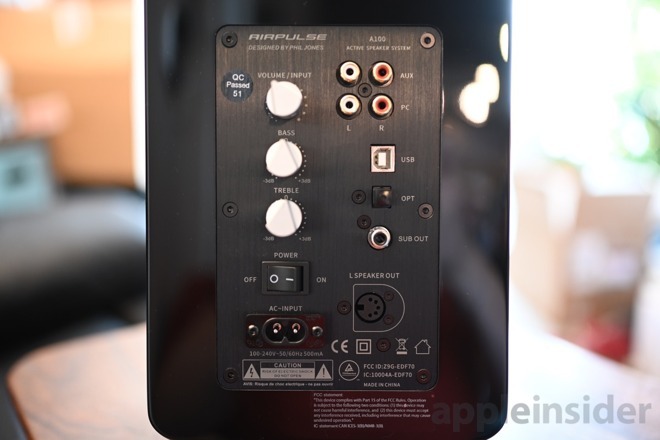 AirPulse did an excellent job in balance the Hi-Fi audio quality, small footprint, and multiple inputs. The look is a bit on the common side but when kept clean, the lacquered finish really stands out. 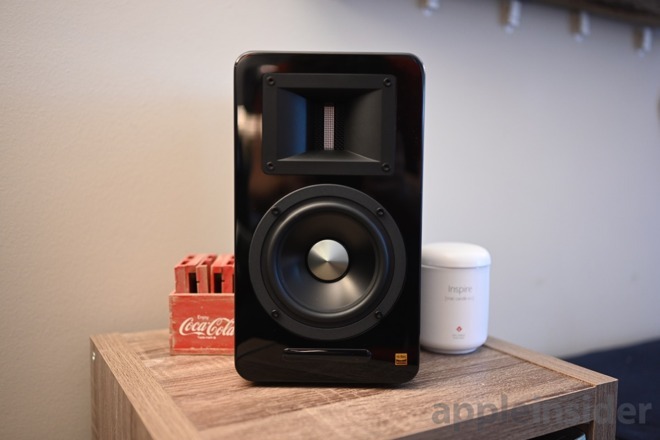 The only way we'd be able to improve upon the A100s is if they were Wi-Fi enabled with support for AirPlay 2. But if you prefer to hook up with a wire and have Bluetooth available for streaming, these are a great way to go without compromising. 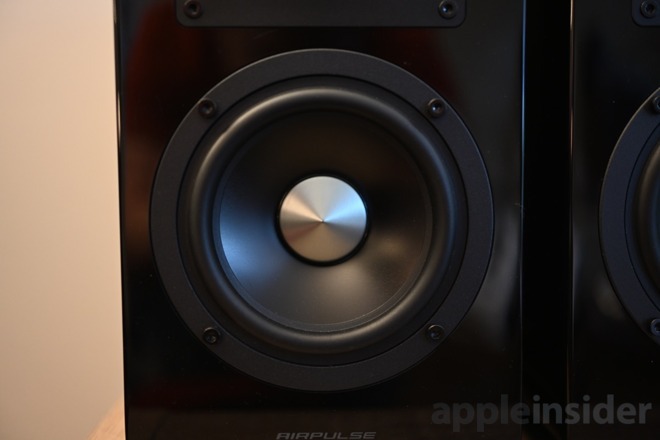 The AirPulse A100 speakers are available in a pair for $799.99 on Amazon in either piano black or vivid red.